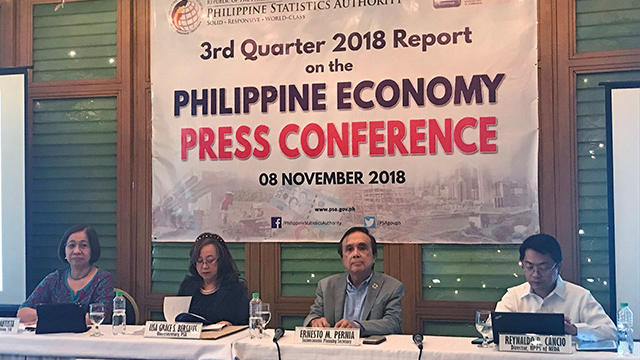 The Philippine economy grew by 6.1 percent year-on-year in the third quarter of 2018, the lowest since 2015, the Philippine Statistics Authority (PSA) announced on November 8, Thursday. 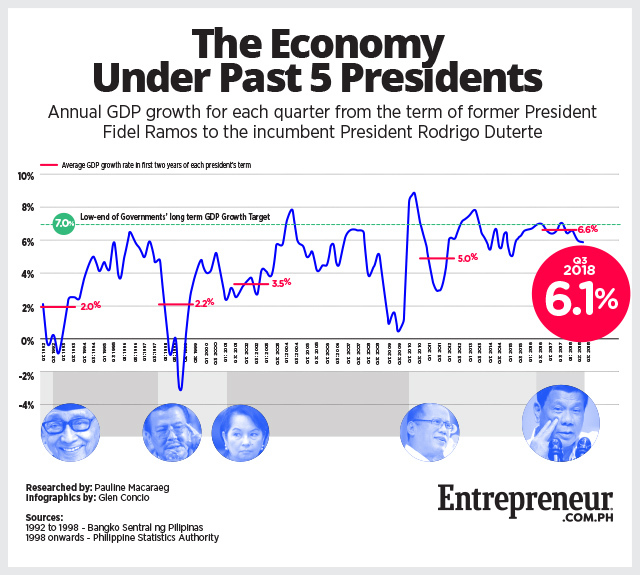 The country’s economic performance in the third quarter of the year is slightly below the revised gross domestic product (GDP) growth of 6.2 percent in the second quarter. This brings the 2018 average to 6.3 percent, below the government’s full-year targets. “The Philippines needs to expand by at least 6.7 percent to achieve the 6.5 to 6.9 percent growth rate for the whole of 2018,” Economic Planning Secretary Ernesto M. Pernia said. Though Pernia admits that the economy’s performance in the third quarter is “less than what we had hoped for,” he said that it still puts the country as one of the fastest-growing economies in Asia—just after Vietnam’s 6.8 percent and China’s 6.5 percent. Pernia said policy decisions, such as the temporary shutdown of Boracay, made a dent in the economy and contributed to the slowdown. “But all measures should be sustainable in the long run development of the economy. These policy decisions were prudent and judicious,” he assured, adding that the recent resumption of services in Boracay is seen to boost both the tourism and services sectors in the medium-term. Overall, the agriculture sector pulled down the GDP by 0.03 percentage points, while the services sector contributed the most with 4.1 percentage points. “We are concerned not because it went below expectations but because the reason for the slowdown is the slowdown in household consumption,” Pernia said. Household consumer spending growth fell to 5.2 percent in the third quarter from 5.9 percent in the previous quarter as inflation dampened spending. While inflation in food products has softened over the past few months, it still remains high compared to other consumer sectors. Pernia said inflation should be moderate in the end of the year as forecast by BSP, but he still urged Congress to pass the Rice Tariffication bill, which he said would bring down the price of rice by Php2 per kilo. “With high prices, demand is seen to be dampened. We are addressing this more strongly. Food prices, more strongly,” he added.